Extra! Extra! Some fresh disappointments in the main competition at Cannes: Cristian Mungiu’s long-awaited Beyond the Hills—save for a single, riveting opening shot—proved to be anticlimactic and rather shallow in its indictment of organized religion, while John Hillcoat 1930s bootlegers’ drama Lawless relied too heavily on administering a string of violent outbursts rather than on structuring a story and delivering convincing characterizations. The letdowns made me think back to Apichatpong Weerasethakul’s Mekong Hotel, screened a couple of days ago outside of competition, as well as outside of reality itself—or so it seemed to this writer for its entire, perfectly judged running time of mere 66 minutes. Joe’s latest is by no means as momentous or complex as his Palme d’Or-winning, reality-bending Uncle Boonmee Who Can Recall His Past Lives, but it works wonderfully both as a miniature and an interlude. 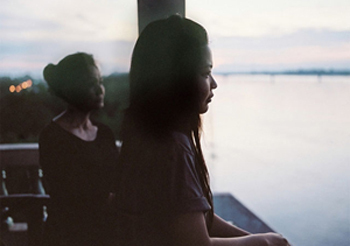 Set in the eponymous establishment and delivered as a series of static shots of serene, unobtrusive beauty, Mekong Hotel is both a wistful portrait of a tentative flirt and a reflection upon its own making. Ghosts and phantoms make their obligatory turns, always welcome in Joe’s universe and hardly distinguishable from the living. At the very start we see the director himself, as he’s instructing a musician on a desired interpretation of a guitar ballad that will hitherto become the movie’s only score: heard wall-to-wall on the soundtrack and flowing through the nooks of one’s mind seamlessly, only to become sorely missed once the screening is over. Both the director and his characters keep reflecting on different layers of past and present, and the way Joe’s camera moves from room to room and terrace to terrace of the Mekong Hotel made me think of yet another non-narrative masterpiece of casual observation and underlying sadness, namely Andy Warhol’s 1966 mammoth Chelsea Girls. Weerasethakul, too, is interested in performance and addicted to capturing fleeting moments of faintly simmering desire. His latest plays like a cinematic lullaby that you keep hearing even after you fall asleep. It seeps into your dreams and makes them ebb and flow to its own lazy beat. And tomorrow… on to the new Haneke and his vision of Love!